Punjab National Bank Specialist Officer Admit Card 2019 Is Out: The Punjab National Bank (PNB) officials had released the Punjab National Bank Hall Ticket 2019 on 15th March 2019. So, candidates who are ready to face the competitive Specialist Officer (Senior Manager (Credit), Manager (Credit), Senior Manager (Law), Manager (Law), Manager (HRD), Officer (IT)) test must and should focus on this page to get the complete information of the pnbindia.in SO Admit Card 2019. Furthermore, they are ready to conduct the written test on 24th March 2019. Get the direct link to download the PNB Specialist Officers Admit Card 2019, the Punjab National Bank Exam Date from the end of this page. Also, you can follow the steps to download the ਪੰਜਾਬ ਨੈਸ਼ਨਲ ਬੈਂਕ Admit Card 2019 online from the official site. And the link attached to the end of this page is activated now. So, click on that link to obtain your PNB SO Admit Card 2019. Candidates who have recently applied for the Punjab National Bank Recruitment 2019 need to get the information to download the PNB Specialist Officers Admit Card 2019. Furthermore, the scheduled Punjab National Bank Exam Date is 24th March 2019. So, be prepared with all the information provided on our webpage. Do make sure that you are carrying the valid ਪੰਜਾਬ ਨੈਸ਼ਨਲ ਬੈਂਕ Manager Hall Ticket 2019 to the examination hall. Candidates should bring the printout of their pnbindia.in Admit Card 2019 in the examination hall. A candidate is advised to validate all the details mentioned on their Hall Ticket. Follow the below given steps to download the Punjab National Bank Hall Ticket 2019 from the official site online. Firstly, candidates should go and visit the official site of the Punjab National Bank, i.e., pnbindia.in. Aspirants will get the home page of the Punjab National Bank. Then, you all need to look at the “What’s New” section that appears to the right down of the screen. Now, click on the scrolling link that refers to “Click Here To Download The Call Letters For The Online Examination For Recruitment Of 325 Technical Officers“. The login page redirects the applicants. Fill the details in the fields mentioned like Registration No/ Roll No, Password/ DOB (DD-MM-YY). The screen shows the Punjab National Bank Hall Ticket 2019. Verify the details before downloading. Every individual should click on download option for Punjab National Bank Admit Card 2019. Take the print of the admit card and make a copy of it for further use. 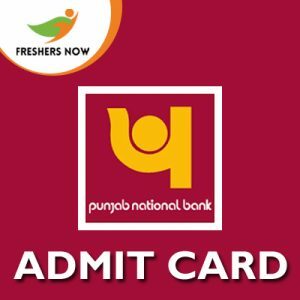 You can also get the information accurately about the Punjab National Bank Admit Card 2019 only if you stay with us on FreshersNow.Com page. Bookmark us by Ctrl + D to get all the single push notifications of the Government Jobs, Hall Tickets, Exams, Syllabus, Results, Previous Papers and many more.